What makes your marshmallows special? I want to buy marshmallows for an upcoming event - when should I order? How many marshmallows should I buy for my party? Are they kosher or vegan? How many marshmallows will I get? When will my order arrive at its shipping destination? 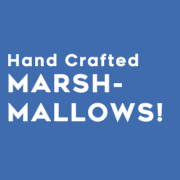 We make our marshmallows from scratch, using all-natural ingredients and high quality flavorings and toppings. These aren't just plain marshmallows that are coated or covered, they are flavored throughout and make for a unique and delicious treat. While they are delicious to eat right out of the package, they are even more wonderful when you toast them - either in the backyard, on the camping trip, or right in your own kitchen. And they melt great on top of your coffee or hot cocoa! Uh, no. Take a look at the ingredients in a pack of traditional store-bought marshmallows, and see if you notice anything unappealing. Well, first there is the corn syrup. While technically not unnatural, corn syrup has been under heavy scrutiny as an ingredient and we've chosen to avoid it. But what else is in there? Artificial blue color #1 - Why does a white marshmallow have blue coloring? Well, sometimes those marshmallows can be on the shelf for a very long time, and the blue dye helps to keep them white. We prefer to sell our marshmallows as fresh as possible, and within a timeframe that they keep their all-natural colors. Tetrasodium pyrophosphate - This is labeled as a "whipping agent", but tetrasodium pyrophosphate is a food additive of many uses. According to Wikipdedia, tetrasodium pyrophosphate is used in "chicken nuggets, marshmallows, pudding, crab meat, imitation crab, canned tuna, and soy-based meat alternatives and cat foods and cat treats where it is used as a palatability enhancer." It's also used in toothpaste for tartar control. Our marshmallows are made and sold as fresh as possible. However, unopened bags will keep just fine for up to 6 months if you take proper care of them. Keep them out of the sunlight and away from the heat, and they should stay nice and soft and tasty. Once you open the bag, store them in an airtight place. They'll stay fresh for up to two weeks, and you can even freeze them if you want to keep the opened bag even longer. So we suggest placing your order about 3 weeks prior to your event, depending on the time of year. This insures that we have your desired flavors in stock, the 3-6 shipping days are covered, and any surprises or problems that crop up can be dealt with. If you are ordering close to holidays, or you just like to make sure you're covered, you may want to add a week to that just in case. Each 2 pound of Plush Puffs contains between 120-140 marshmallows depending on the flavor (Peppi-Mint has the most, Chocolate Chipetta has the fewest). We typically recommend a bag each of 3-4 flavors for a party, just so you can have a nice range of flavor options. Make sure to have some air-tight baggies available after the party for guests to take home any extras that you might want to share. Plush Puffs are not certified kosher or vegan. Although our gelatin is actually kosher, our process and facilities have not been officially certified. If you are looking for a kosher or vegan marshmallows, there are companies who produce these specifically and you should be able to find some. We'd love to make them, but those gelatins simply turn out marshmallows with different textures that melt and toast much different than our own. In one of our regular retail boxes, there are 4 oz. of marshmallow, or about 16-18 marshmallows, depending on the flavor (e.g. Vanilla Bean are lighter, so there will be more in a box and Chocolate Chippeta are slightly heavier so there will be fewer). In a box of MugToppers, there are 4.2 oz. of marshmallow, or 6-8 individual MugToppers, depending on how thick they are. As part of our artisanal confectionery process, we hand pour all our marshmallows into pans before cutting them into cubes or MugToppers, which also adds to the variation in the number and size of the marshmallows in a box. We package orders up for shipping during regular business hours on Mondays, Tuesdays, Wednesdays and Thursdays only (we ship nothing on Fridays). Given our volume of orders, it may take anywhere from 1-3 days for us to process and package up your order. In other words, it likely will not be processed for shipping on the exact day you order, and if you order after Thursday at 5pm, we will not see your order until Monday at 9am. While we do hold some inventory, our marshmallows are made fresh to ensure that you get the best, most delicious treats every time. If we happen to be out of stock of an item you order, it may take a little extra time to make and package your marshmallows. If we are out of stock and it looks like it will take longer than 2-3 days to get your order ready, we make every effort to contact you to see if you would like to make a substitution or change your order. During periods of high demand, we increase our production but that might also have an effect on shipping time. UPS Ground has the longest delivery time, but the lowest cost. Estimated delivery times are only for the time that the package is in the hands of UPS and DOES NOT include the order processing time as described above in #1. As a result, UPS Ground might take up to 10 days to get to the shipping address, and even UPS Next Day Air might take up to 3 days to arrive. NOTE: We occasionally have super low shipping options that use the United States Postal Service (USPS). This option may take additional days to ship. Once your package has shipped, you will receive an email letting you know your order has shipped and with any available tracking information.